This little dog is just what the standard describes in my opinion. Too many exhibitors feel rectangular means long in body; it does not. Too many exhibitors fail to understand the correct top line. The tail is set on high and there is a slight rise to the set of tail. MANY of this breed have a roach in the top line with a dip to the tail. This for me is a HORRIBLE fault. I like a dog that says, "I'm a toy dog regarding his/her size." The other issue missed is the correct length of upper arm. Your kind of a dog will ALWAYS win when I am judging. 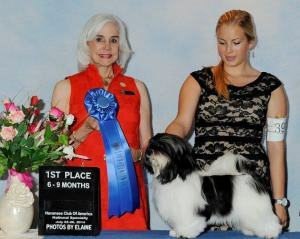 First AKC Show in 2015 William goes Best overall Male, Best of Winners over all the class females, and Best opposite over the Male Champions/Specials including some of 2014 AKC Top Winning USA Havanese. A proud moment for MistyTrails. Thankyou Jenna. Showing against some exceptionally Nice Havanese! 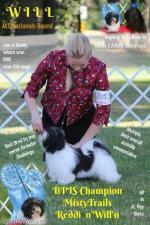 Best of Breed over a dozen + AKC top specials! 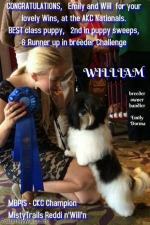 February show in Manitoba brings William 5 Group Placements and he is now #1 havanese 'dog' in Canada as of February 2015. Thankyou Penny Lewis (William's Prarie Gal) for sharing your weekend with William. William will be back with Penny in March! William - Summer 2015 - 2x Best in Show! 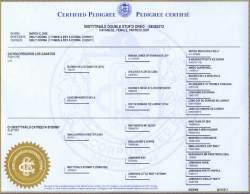 Copyright� Elite Havanese, all rights reserved.